Luxury Real Estate Tip: Fake it till You Make it? Not in Real Estate! Not long ago someone sent us a link to a video, where a well-known speaker (a real estate broker) emphatically stated that all real estate is alike. As long as you know the basics, i.e., farming and writing an offer, you can be tops in any of the different categories of real estate. This individual went on to say that all you need to be known as a Luxury Real Estate agent or a Commercial Real Estate agent is to print a card with your name and contact information. Just put Commercial or Luxury Real Estate Agent under your name, and get on the phone, because those agents who pretend to specialize in those arenas do not farm. When we were managing a real estate office in Napa on behalf of a client, someone inquired about buying a vineyard. One of the agents said, I drink wine: therefore, I can take that lead! Really? What do you know about vineyards? Have you sold one? What are the permits, city restrictions, water rights involved in creating a new vineyard? How many plants can be in a row? Is it better to start a new vineyard, or buy an existing vineyard because one can add value if the vineyard was planted in the 60’s. Which area of Napa is better suited for Cabernet Sauvignon, or Chardonnay? Here is another example. I work in a commercial building, and I can sell commercial real estate. Really? How do you compute an IRR (Internal Rate of Return)? Do you know what an Estoppel Certificate is? What is the Cap Rate of that building? Is the building up to handicap/earthquake codes? I eat at restaurants: therefore I can lease and sell restaurants. Really? What are the handicap rules for the turning radius for a wheelchair in the bar area? What is the size of the gas line? What are the fire restrictions, and does it have the required parking ratio? Can you get a liquor license? I own a Louis Vuitton purse: therefore I can sell luxury homes. Really? Can you tell the difference between mahogany floors and dark walnut ones? Have you ever seen Purple Heart wood? Do you know where the umbrella can be found in a Rolls Royce? Do you know the value of seamless glass for sliding glass doors? 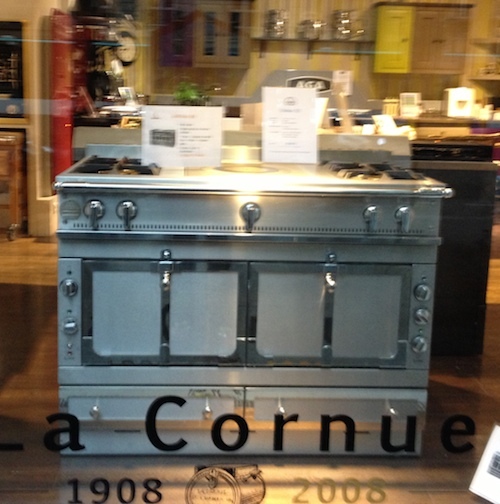 Have you heard of a La Cornue stove or an Aga stove, pictured above?